ABOUT THIS SITE All Sunni and Shia authorities (till 1300H/1900CE) are united upon the existence and reality of Abd Allaah bin al-Saba who played a role in stirring up a revolution against Uthman bin Affan (radiallaahu anhu), claiming Ali (radiallaahu anhu) was the more worthy and legitimate ruler. He eventually claimed Ali is Allaah himself. Within this historical background, the foundations of the doctrines of the Shia were laid down such as ascribing Lordship (Rububiyyah) to their Imaams, making the concept of Imaamah a central pillar of the religion, making Takfir of the Companions, making claims of an incomplete and tampered with Qur'an amongst others. Today the Shia are present in many Muslim lands and the Raafidee state of Iran sponsors much of the propaganda against the people of Tawhid and Sunnah as part of a wider agenda to eliminate Ahl al-Sunnah and to replace the Sunnis with themselves. This involves the use of proxies in other lands such as Lebanon, Saudi Arabia, Bahrain, Yemen. 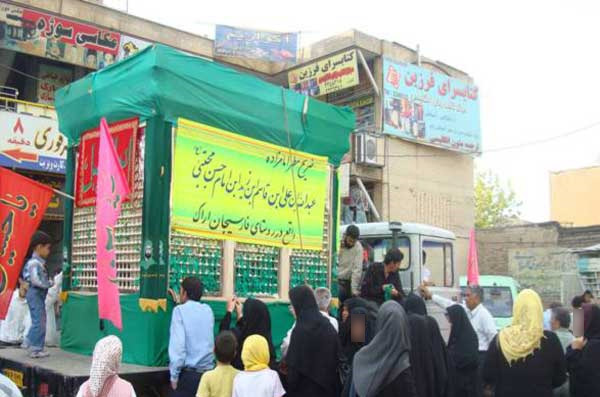 The picture is of a "mobile" mock shrine (of a member of the Ahl al-Bayt) through which simple commoners are defrauded of their money with the lure of receiving aid, rescue, benefit and intercession through the deceased.